Wesendonck-Briefe 101-5, tr. Spencer and Millington. These words from Ulrike Kienzle provide a perfect link between the extracts that I had quoted above and below. I have borrowed them from her recent essay, Parsifal and Religion: A Christian Music Drama?, of which the German original appeared in her book, ...daß wissend würde die Welt! Religion und Philosophie in Richard Wagners Musikdramen (Wagner in der Diskussion, Band I, Verlag Königshausen & Neumann, Würzburg, 2005, pages 189-229). A slightly revised version of the essay has been included in A Companion to Wagner's Parsifal, ed. William Kindermann and Katherine R. Syer (Camden House, Rochester and Woodbridge, 2005, pages 80-130) in an English translation by Mary A. Cicora. hat's how it is. Wolfram is a thoroughly immature phenomenon, although it must be said that his barbaric and utterly confused age is largely to blame for this, fluctuating as it did between early Christianity and a more modern political economy. Nothing could ever come to fruition at such a period; poetic profundity was immediately submerged in insubstantial caprice. I almost agree with Frederick the Great who, on being presented with a copy of Wolfram, told the publisher not to bother him with such stuff! 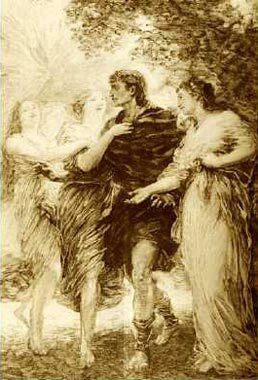 Left: Henri Fantin-Latour: "Parsifal et les filles-fleurs", from L'Illustration, 29 April 1893.
had to make a completely fresh start with Parzival! For Wolfram hadn't the faintest idea of what he was doing: his [i.e. Parzival's] despair in God is stupid and unmotivated, and his conversion is even more unsatisfactory. The thing about the Question is that it is so utterly preposterous and totally meaningless. I should simply have to invent everything here. And then there is a further difficulty with Parzival. He is indispensably necessary as the redeemer whom Anfortas longs for: but if Anfortas is to be placed in his true and appropriate light, he will become of such immense tragic interest that it will be almost impossible to introduce a second focus of attention, and yet this focus of attention must centre upon Parzival if the latter is not simply to enter at the end as a deus ex machina who leaves us completely cold. Thus Parzival's development and the profound sublimity of his purification, although entirely predestined by his thoughtful and deeply compassionate nature, must again be brought into the foreground. But I cannot choose to work on such a broad scale as Wolfram was able to do: I have to compress everything into three climactic situations of violent intensity, so that the work's profound and ramified content emerges clearly and distinctly; for my art consists in working and representing things in this way. Wesendonck-Briefe 190-5, tr. Spencer and Millington. [Wagner] designates Anfortas as Tristan des dritten Aktes mit einer undenklichen Steigerung" (my third-act Tristan inconceivably intensified). This "potentiation" consists in being not only, like Tristan, subject to the desires of love as a furchtbare Qual (terrible torment) but beyond that, Anfortas must painfully feel how inadequate he himself is when compared with the Redeemer, who can in this context be identified with Christ. There exists some mystical association between Christ and Anfortas. As King of the Grail and its high priest who presides over the Grail ceremony, Anfortas is a representative of Christ; this identity is underscored by the fact that Anfortas was wounded in the same place as Christ (in his side), and, as Wagner will later make clear, with the same weapon that wounded Christ. But unlike Christ, who suffered to redeem the world (Wagner wrote that Christ "Weltensagend, Welterlösend, Weltleidend am Kreuze schmachtete" [died on the cross renouncing, redeeming and suffering for the world]), Anfortas has succumbed to his sensual desires and betrayed his divine mission. The will to existence expresses itself according to Schopenhauer most directly in Eros; in that way it propagates itself from one generation to the next, and thus egotism and suffering continue as well. Sensual lust is for Schopenhauer the quintessence of egotistical self-love. Therefore — Wagner continues — the Grail Knights live ascetically. For that reason, the "Liebesabenteuer" (lustful encounter) of Anfortas is no mere indiscretion that can easily be pardoned but rather an act of pure egotism and thus a betrayal of Christ2. He is a perverted Christ figure: he has failed in his task of becoming a redeemer of the world. None of the Grail works with which Wagner was acquainted contain such a connection between Christ and the Grail King3. In contrast, Parzival is predestined by his ... thoughtful and deeply compassionate nature to overcome egotism and become the true follower of Christ. To that end, though, he needs to undergo development ... most sublime purification, as Wagner recognized early on in the project. This task presented him with a problem: he feared [as he expressed at the start of the extract above] that the center of interest would be Anfortas, and not Parzival. In 1859 he evidently lacked a solution and a way of portraying the transformation from fool to redeemer. He found a model for this process in Indian works. But his intensive preoccupation with the world of India allowed another figure of the drama to emerge. 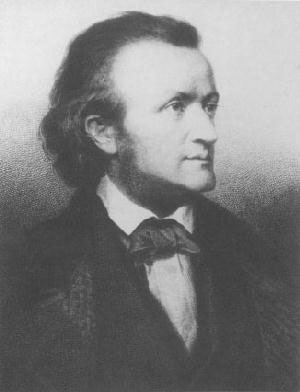 In a letter to Mathilde Wesendonk from the beginning of August 1860 he talks about ... the profound idea of metempsychosis ... and applies this to the conflict between Elsa and Lohengrin ... Kundry exemplifies the Indian [Vedantic] doctrine of metempsychosis, which Wagner learned about from Schopenhauer's works and his studies of Indian religions. Although Wagner centered his drama around the Christian sacrament of the Eucharist and the meaning of Good Friday in this Christian context, early on in the project he synthesized these elements of the plan with concepts taken from Indian religion4. Ulrike Kienzle, ibid. Translation by Mary A. Cicora, slightly modified to match Spencer's translation of the extract above. letter from a man in Duisburg, wanting to link a study of Parsifal to a study of Wolfram's Parzival, irritates R. He says, I could just as well have been influenced by my nurse's bedtime story. to the place from which he came). 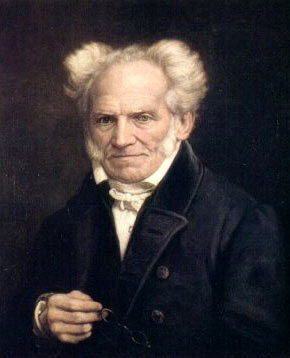 Above: The philosopher: Arthur Schopenhauer, in a portrait of ca. 1850. The World as Will and Representation, tr. E.F.J. Payne, volume 2, chapter 46. Footnote 2: Compare Tannhäuser, whose dalliance in the Venusberg is obviously more than a mere indiscretion. It is serious enough to require confession to, and if it can be obtained absolution from, the Pope. This makes sense if Tannhäuser has broken a vow of celibacy. If so, then there is a clear parallel with Amfortas/Anfortas. Footnote 3: Although one possible interpretation of the "two kings" motive that runs through the Grail Romances is that the Fisher King represents Christ while the old, hidden king represents God the Father. Footnote 4: Although Ulrike Kienzle's essay is brilliant, insightful and among the best treatments of the religious aspects of Parsifal to date, I have to disagree with her argument that the Anfortas problem led to the duality of Kundry, and from there to rebirth as an element of the drama, which appears in the Prose Draft of 1865; because it is my conviction that ideas Wagner had found in his reading about Indian religions already influenced his earliest thoughts about the drama, in the period 1857 to 1860. Even if he did not, at that time, consider Kundry to be living an unending cycle of rebirths, Wagner probably at an early stage considered Parzival to have grown in "purity" through a succession of earlier lives in which he had names that he has forgotten.